Fred Tomaselli (American, b. 1956). Echo, Wow, and Flutter, 2000. Leaves, pills, photocollage, acrylic, and resin on wood panel, 84 x 120 in. (213.4 x 304.8 cm). Albright-Knox Art Gallery, Buffalo, New York. James G. Forsyth Fund. Image courtesy of the Brooklyn Museum. 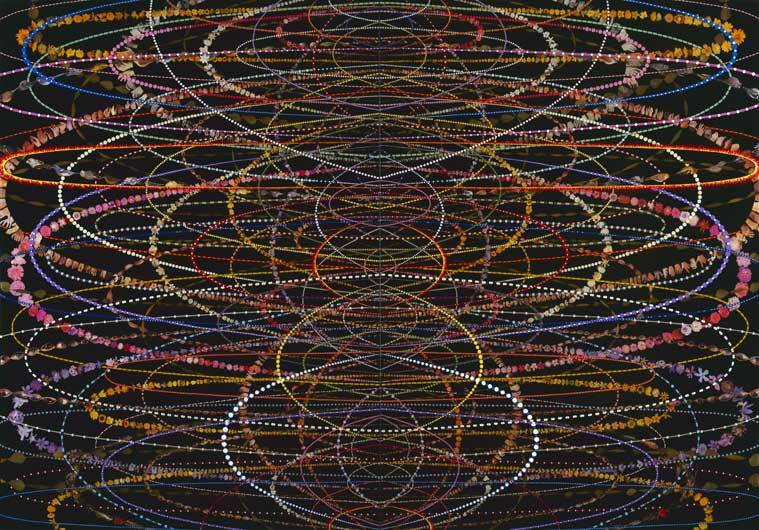 Brooklyn-based artist, Fred Tomaselli is now showing at the Brooklyn Museum. The solo show is dedicated to the artists two-dimensional works from the late 1980's through to the present day. Tomaselli was born in California in 1956 and has made a name for himself in contemporary art creating detailed paintings that combine the practice of encapsulating weird and wonderful materials in a layer of clear, epoxy resin over the top. Amongst the materials that Tomaselli suspends in the resin are prescription tablets, hallucinogenic plants and images of flowers, birds, arms and legs. Combining traditional painting and more abstract collage, Tomaselli creates fascinating and intricate works that are stunning from a distance, and utterly captivating up close. The exhibition in Brooklyn opened yesterday and will run right through until the 2nd January 2011. The show takes an in-depth look at the development of Tomaselli's work and how he went from early experimentation with photograms and collage, to his more recent paintings and print series. Tomaselli is an interesting character in himself; fascinated with botany and ornithology and a hoarder of prescription pills and images of plants, birds and body parts cut from books. He amasses detailed visual archives from which he pulls influence and material for his works. Around 40 works are being shown at the exhibition, including two which were specially created for the occasion. The first called "Night Music for Raptors" and the other "Starting". Both of these works are part of Tomaselli's recent exploration and investigation into the form and nature of individual birds, with "Night Music for Raptors" comprising the study of an owl, made up of hundreds of cut out eyes and the later being a striking creation of a starlings head. The exhibition is already running at the Brooklyn Museum. Find out more about the museum and the exhibition on the Brooklyn Museum website.